LOCATION.--Lat 41°27'40.4", long 74°45'31.6" referenced to North American Datum of 1983, Sullivan County, NY, Hydrologic Unit 02040104, on right bank 300 ft downstream from powerplant, 0.5 mi downstream from Bush Kill, and 2.8 mi upstream from mouth and Mongaup. PERIOD OF RECORD.--August 1939 to March 1995, October 2013 to current year. REVISIONS HISTORY.--WDR NY-71-1: 1970. WDR NY-81-1: 1980. WDR NY-82-1: Drainage area. GAGE.--Water-stage recorder and crest-stage gage. 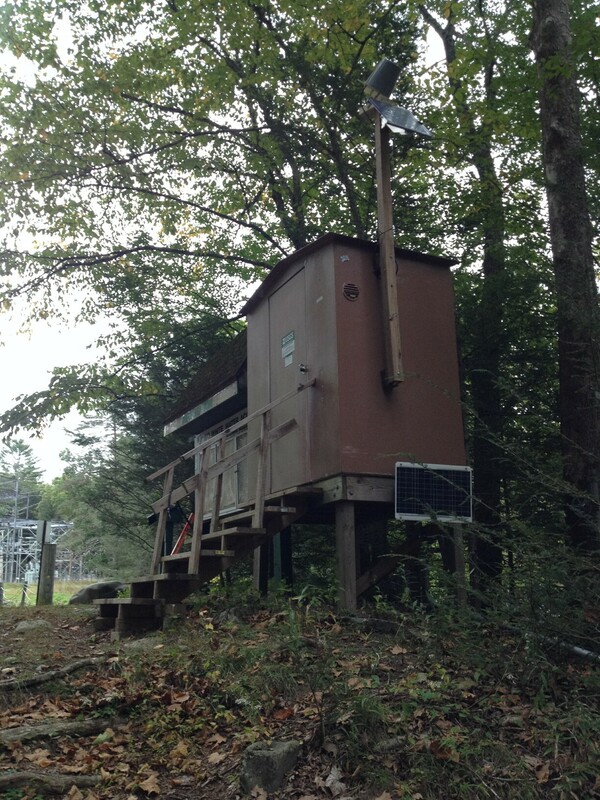 Datum of gage is 625.05 ft above NGVD of 1929 (levels by Orange and Rockland Utilities, Inc.) and 623.49 ft above NAVD of 1988. Prior to July 6, 1956, water-stage recorders at sites 25 ft upstream on Rio tailrace and 200 ft upstream on natural channel, at datum 4.0 ft higher. REMARKS.--Entire flow regulated by powerplant except for runoff from about 7 mi² of drainage area downstream from Rio Dam, and during periods of spill from Rio Reservoir. Flow also regulated by storage in Cliff Lake (station 01433200), Swinging Bridge Reservoir (station 01433000), and Toronto Reservoir (station 01433100) and small reservoirs upstream from station. EXTREMES FOR PERIOD OF RECORD.--Maximum discharge, 16,100 ft³/s, Aug. 19, 1955, gage height, 15.22 ft, present datum, from rating curve extended above 6,900 ft³/s; minimum daily, 6 ft³/s, Oct. 1, 1939, minimum instantaneous discharge not determined. EXTREMES OUTSIDE PERIOD OF RECORD.--Maximum discharge, about 10,000 ft³/s, Apr. 3, 2005, gage height, 11.9 ft, from floodmark in gage well. PERIOD OF DAILY RECORD1.--SPECIFIC CONDUCTANCE: October 2013 to current year. WATER TEMPERATURE: October 2013 to current year. pH: October 2013 to current year. DISSOLVED OXYGEN: October 2013 to current year. INSTRUMENTATION1.--A continuous water-quality monitor with water temperature, specific conductance, pH, and dissolved oxygen provides 15-minute-interval readings. EXTREMES FOR PERIOD OF DAILY RECORD1.--SPECIFIC CONDUCTANCE: Maximum, 234 uS/cm at 25 °C, Mar. 19, 2017; minimum, 104 uS/cm at 25 °C, Oct. 28, 2013. WATER TEMPERATURE: Maximum, 24.5 °C, Sept. 25, 27, 2017; minimum, 0.5 °C, Feb. 8, 17, Mar. 1, 4, 2014. pH: Maximum, 8.8, Jan. 26, 31, 2015; minimum, 6.1, July 2, 2016. DISSOLVED OXYGEN: Maximum, 15.8 mg/L, Feb. 14, 18, 19, 22, 23, Mar. 3, 5, 2016; minimum, 3.3 mg/L, Sept. 22, 2015.